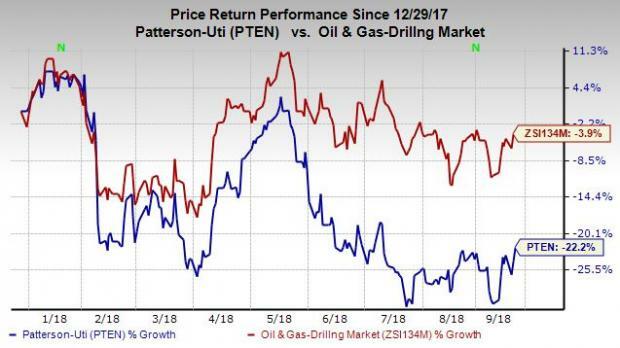 Patterson-UTI Energy, Inc.’s PTEN share price movement has been weak, both in absolute and relative terms. Patterson-UTI’s shares have plunged 22.2% on a year-to-date basis, underperforming the industry’s 3.9% decline. The Texas-based energy company failed to impress investors this year, as it delivered weaker-than-expected earnings in the first two quarters. Let’s take a look at the factors responsible for the dismal price performance and results of the company. Patterson-UTI’s pressure pumping unit, which deals with providing various vital services to new and existing wells, account for around half of the company’s revenues. The pressure pumping operations in North America have been on a rise due to surging production. However, pipeline constraints have softened the prospects of the pressure pumping segment of late. With large exposure to the U.S. pressure pumping market, Patterson-UTI is bearing the brunt of weak fracking fundamentals. As we know, while crude production has been reaching new records courtesy of oil strength, pipeline capacity is not increasing in proportion. Infrastructural bottlenecks, especially in North America’s hottest shale play, Permian Basin, are forcing producers to lower their spending capacities as well as output levels of late. In fact, the oversupply scenario is not just limited to the Permian Basin. Prospects of the hydraulic fracturing market do not look bright, with producers suspending the completion of wells. With upstream players slowing down their spending levels and production, Patterson’s pressure pumping unit has been badly hit. Patterson-UTI’s earnings and revenues in the second quarter lagged expectations on sluggish pressure pumping operations, with segment margins being dragged down by oversupply and operational delays. With the fracturing market becoming saturated, it has decided to temporarily stop the deployment of new pressure pumping fleet. In fact, the company has already warned investors that the pressure pumping business is expected to face weak industry conditions in the short term due to oversupply. Weak market sentiment and lower utilization, with respect to pressure pumping, are expected to persist throughout 2018 and result in Patterson-UTI’s share price drop. The company expects revenues and margins from its pressure pumping unit to decrease 5% and 7.5%, respectively. Patterson-UTI is also bearing the brunt of increasing costs, which are affecting its earnings and financials. In the second quarter, Patterson-UTI incurred direct operating expenses of $621.8 million, reflecting a 45.55% jump from $427.2 million reported in the year-ago quarter. Its balance sheet appears to be quite fragile, with current cash position of $242 million, weakening from $304.3 million at the end of the first quarter. The Zacks Consensus Estimate for third-quarter and full-year 2018 earnings has moved 433% and 215% south, respectively, over the past 60 days. The unfavorable earnings estimate revisions are reflective of investors’ pessimism surrounding the stock. Notably, the company also has a dismal earnings history, missing estimates in three out of the trailing four quarters, with an average negative earnings surprise of 30.48%. Furthermore, the company’s Momentum Score of F highlights its short-term unattractiveness. Undoubtedly, the above negatives substantiate the company’s Zacks Rank #4 (Sell). Investors interested in the energy sector can consider some better-ranked stocks such as Petróleo Brasileiro S.A. PBR, Helix Energy Solutions Group, Inc. HLX and TC Pipelines, LP TCP, each flaunting a Zacks Rank #1 (Strong Buy). You can see the complete list of today’s Zacks #1 Rank stocks here.